Starting with four "blocks" in 1847 four different additions have increased the cemetery size to what it is today. 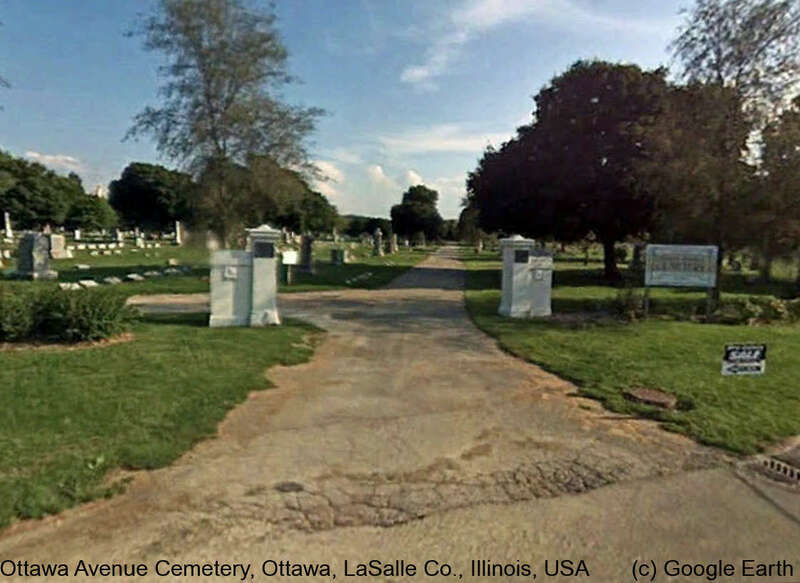 The four original blocks and the first addition are what is called Ottawa Cemetery; the second part is the Ford Addition, the third the St. Francis Addition, and the final area is the Bushnell Addition. Finding graves is relatively easy, Each section of the cemetery is coded as follows. Ottawa Cemetery (along with the four original blocks): All burial plots start with the letters "OT" followed by the Lot Number then the Section Number. On the map be sure to find the Section Number first, which is usually the number after the dash symbol, then the Lot Number. Example: OT, 15-3. Note that there are some lots that have "1/2" in them. Mausoleum: Crypts in the mausoleum are coded "BU, MM," and then a number. The mausoleum is normally locked. Be sure to make arrangement with the cemetery if you need to see a burial crypt there. Getting around in the cemetery is very easy as there are many roads so you never have to walk very far to visit a grave.